Remember I told I spent Sunday at JC Penney? This is what I got... colorful jeans! I was so excited because they were only $16 (originally $40)- I decided to take them in royal blue too (and I wore them the day after, so you'll see them soon). My day started at 6am to go to class at 8am, I wore a similar version of this outfit (sandals instead of wedges and a casual necklace). Later at night, we headed to the movies because I won some tickets to saw a private screening of Crazy Stupid Love- however, we got there a little late and the theater was full. We decided to stay at the mall but the heat made it impossible- I felt like I was going to melt because of the jeans. I know I have complained of the heat several times- but I'm serious.. this is not normal (90F degrees at 8pm!!). Thanks for your sweet comments!! I really appreciate it! ¿Se acuerdan que les conté que pasé el domingo en JC Penney? Esto fue lo que encontré JEANS DE COLORES- estaban a solo $16 (originalmente $40) así que agarré estos y unos en azul rey (parte del outfit de mañana). Utilicé una versión similar a este outfit en la mañana (pero con sandalias en vez de tacones y un collar más de día)- luego en la noche nos adventuramos al cine ya que me gané unas entradas para ver Crazy Stupid Love- pero... había muchísimo tráfico y cuando llegamos la sala de cine estaba completamente llena. Teníamos ganas de quedarnos en el centro comercial un ratito pero el calor no era normal- diran que me la paso diciendo eso pero estar en jeas en un mall al aire libre era IMPOSIBLE. Terminamos cenando y viendo una película en la casa. adoro tus wedges y bolso*_* omg!! te ves hermosa, como siempre, your white tops are always a hit! Those pants are total eye candy! And a steal of a deal, too. You look very cute, I'm loving your jeans! I really want to see that movie. That's too bad that you missed it :/ I live in Phoenix, AZ so you can just imagine how bad the heat is here! i just love your shoes!! Ahora me fui a JC Penney y me compre los pantalones rosados. Me encantaron! Te vez super! Love your jeans and of course the outfit. I bought some royal blue jeans too. 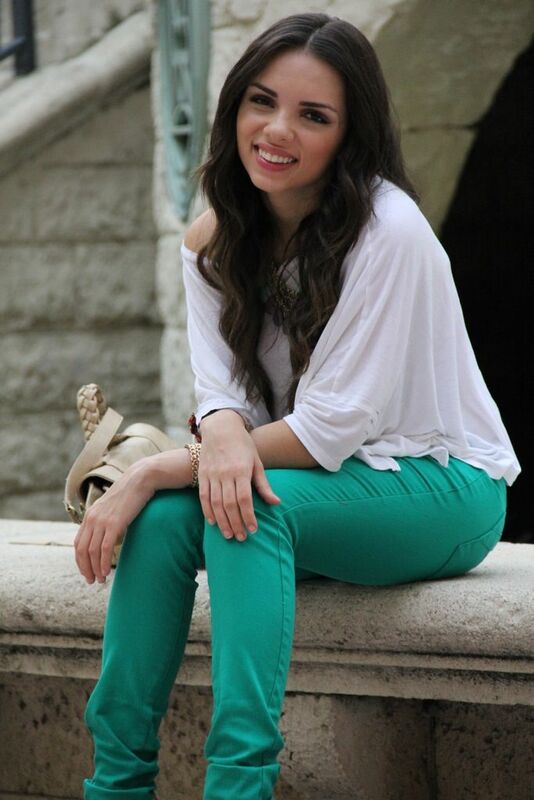 estas preciosa Dany, ideales los pantalones y zapatos, como sabes que me encantan! 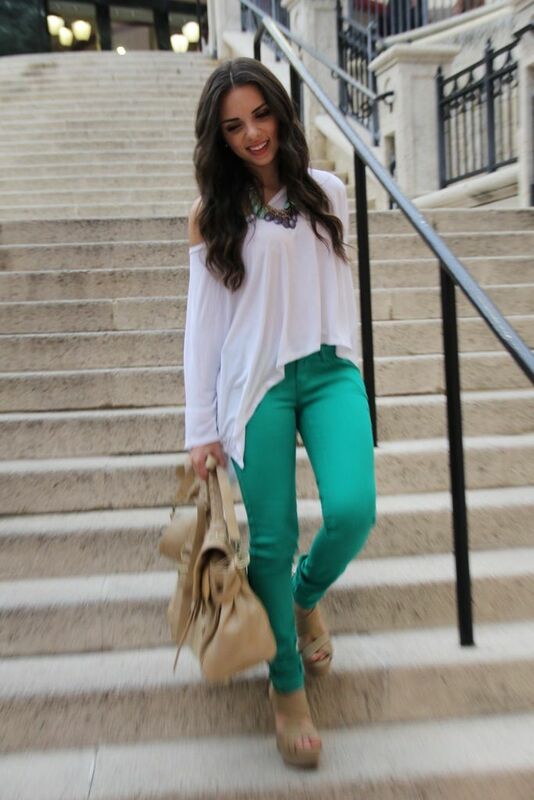 Un look sencillo y perfecto! Me encantan los zapatos. Love the pants, the shoes and the bag..You look great! me encanta el outfit! los pantalones y las sandalias geniales! Hi! I was wondering what is your height? You look always so cute and tiny. :) I'm petite size girl and it's nice to see another small girl dressing nicely! Sabía que no tardarías en enseñarnos tus pantalones nuevos, has elegido un color muy bonito, me gusta lo bien que combina todo, el collar es precioso! You know what I got inspired yesterday by maria from flor de maria and went to jcpenney and got me a pair of blue ones and green ones too!! how cool.. great minds think alike I will be wearing them soon I'm soo happy I got them !!! Me encantó la combinación, sencilla pero fresca. After seeing those jeans on you I just had to buy a pair. I picked up the green color for $19.99. You look fabulous! Que lindo el outfit, que mal que no pudieran ver la peli. Yo quiero verla!!! No sabes como me gusta tu estilo. just followed you! lovin your style. gorgeous! especially this one. very nice shade of green. Me encanto la combinacion! Amo los pantalones de colores, y te quedan genial... las plataformas están hermosas, muy lindo todo. I want to go and buy so many different colored pants now! Great Find at JcPenny. I love this color!